* Nose/canopy/pitot points to MiG-21F/MiG-21F-13 and early J-7 versions or F-7A. White c/s suggest Chinese example, but serial/code (not to mention the Rinas AB shelter in the background) distinguishes the operator Albania, thus the F-7A. Albania received the early Chinese version F-7A by Shenyang, but production had moved to Chengdu. Not to be confused with improved J-7/F-7 versions by Chengdu. ** For Chinese version, NATO 'FISHBED' still applies. 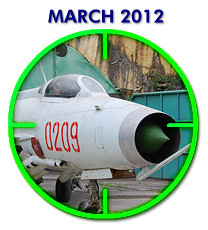 'MONGOL' is reporting name for the MiG-21U/JJ-7/FT-7 two-seaters, does not apply here. Chengdu later export models received names, but they do not apply here (Airguard, Skybolt, etc. ).